Lyons, CO - Baseline-MOCON, Inc., a subsidiary of MOCON, launches a new fast, accurate and cost-effective way to measure live bacteria loads and improve disinfection efficiency for water environments. For the first time, bacteria can be measured in as fast as 45 minutes vs. the 24-48 hours needed with traditional methods. The new GreenLight® Environmental series is ideal for testing of waste, drinking, surface, ground and bottled water operations, as well as beaches, water parks, etc. This leading-edge technology uses a sensor which measures respiration of aerobic bacteria and equates the change in oxygen level to the viable microbial load in a sample. The amount of bacteria in the water/wastewater determines how much oxygen is depleted. Results for non-disinfected final effluent can be obtained within 45 minutes. Ultraviolet (UV) disinfected final effluent requires up to 6 hours. Speed is dependent on the number of colony forming units present. "Not only does the new GreenLight technology save time, but it also significantly decreases energy costs for operations using UV light disinfection. Up until now, these waste and surface water treatment environments have had to run all their lamps at full power to make sure they were controlling bacteria levels. 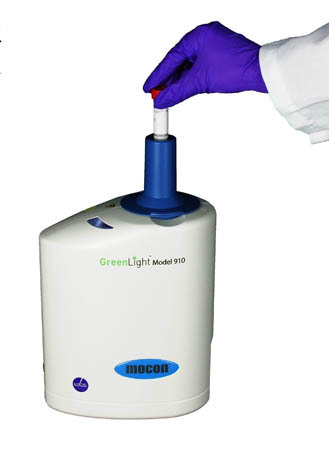 GreenLight's ability to provide accurate data faster than any other testing protocol will enable improved process control which, in turn, will dramatically reduce utility costs," said Ed Askew, Ph.D., an environmental laboratory and regulatory consultant for Baseline-MOCON. Wastewater operations which still rely on traditional chlorine disinfection can also benefit from GreenLight's ability to provide faster results in a cost-effective manner. For recreational environments, such as beaches and parks, GreenLight's portability and testing speed means that decisions, such as closings due to high contaminant levels, can be made more rapidly and accurately. "Another benefit is that the GreenLight instrument is portable and can be operated by unskilled labor. Traditional methods typically require that samples be transported to a lab and evaluated by highly-skilled technicians. This means that a lifeguard or wastewater plant worker can be trained within 30 minutes to perform the test onsite," Askew said. Two models (930 and 910) are included in the initial launch of the GreenLight® Environmental series. The Model 930 targets high throughput and is fully automated using a 24-position carousel system. GreenLight software allows the addition of new tests while others are already in progress. Vials and carousels are individually and uniquely barcoded to ensure accurate recording of results. The flexible Model 910 accommodates a 15.0ml vial in a compact package that is suitable for main water treatment plants, wastewater, field lab or quality control use. Results for both units are automatically recorded to meet good laboratory practice standards specified in the Environmental Protection Agency's 40 CFR part 160 and the Food & Drug Administration's 21 CFR part 58. The GreenLight series is ideal for water hygiene professionals, environmental engineers, municipalities, regulatory agencies, etc., who need an accurate, low-cost method of measuring disinfection efficiency. Baseline-MOCON is known as an industry leader in the development and manufacture of gas analyzers. The company's analyzers employ several principals of gas analysis and detection technology, including gas chromatography and continuous monitors based on flame ionization and photoionization detectors. The product line also includes a variety of complimentary products such as multipoint samplers, calibration systems, sample conditioners, support gas generators, and data acquisition systems. Designed for optimum reliability, compactness and operational simplicity, Baseline products meet the growing demand for environmental, toxic gas monitoring, mud logging during oil and gas exploration, and industrial gas analysis. For more information: www.baseline-mocon.com. MOCON is a leading provider of instrumentation and consulting and laboratory services to medical, pharmaceutical, food and other industries worldwide.